Around 100 million sharks are being killed annually, the most accurate assessment to date of the impact of commercial fishing on sharks suggests. The researchers say that this rate of exploitation is far too high, especially for a species which reproduces later in life. The major factor driving the trade is the ongoing demand for shark fins for soup in Chinese communities. The report has been published in the Journal Marine Policy. Researchers admit that establishing the true level of global shark fishing is extremely difficult, as the quality of the data is poor. Many sharks that are caught have their fins removed at sea with the body dumped overboard. These fish are often not included in official reports. However, the scientists estimate a mortality range of between 63 and 273 million sharks in 2010. “There is a very large range and that speaks to the quality of data, which is not great,” said Dr. Demian Chapman from Stony Brook University in New York, US. “Certainly 100 million is the median estimate and that’s the best estimate there is,” he added. While the number of sharks being caught has not changed substantially between 2000 and 2010, the authors of the research argue that the commercial fishing fleets are simply changing location and the shark species they target in order to keep up with demand. The fear is that eventually these shark species will crash. Fuelling the concern is the fact that many of the species that are most threatened are very slow to reproduce. “A lot of the sharks that are prized in the trade take more than a decade to reach maturity,” said Dr. Demian Chapman. “There is a really razor-thin level of mortality that sharks can experience before their population trajectory becomes negative – that is really what’s been happening. “They are not reproducing fast enough to keep up with the rate we are pulling them out of the ocean,” he added. 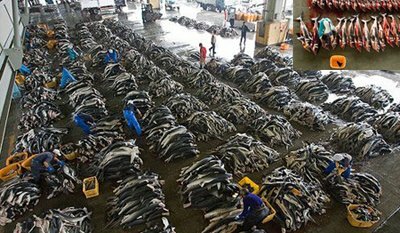 The biggest driver for shark fishing has been the demand for shark fin soup, a product that is seen as a luxury item among Chinese communities. While fins are still being cut off sharks at sea, several countries including Canada, the US and the European Union have tried to restrict this by law. But this has not had the desired effect, Dr. Demian Chapman explained. On Sunday, negotiators from 178 countries will gather in Bangkok for the meeting of the Convention on the International Trade in Endangered Species (CITES). There are proposals to regulate the trade in five of the most threatened species of shark. At a previous meeting in 2010, similar restrictions fell just short of the required-two thirds majority. This time, campaigners say they have broad support among developed and developing countries and are optimistic they will be able to muster the required votes.